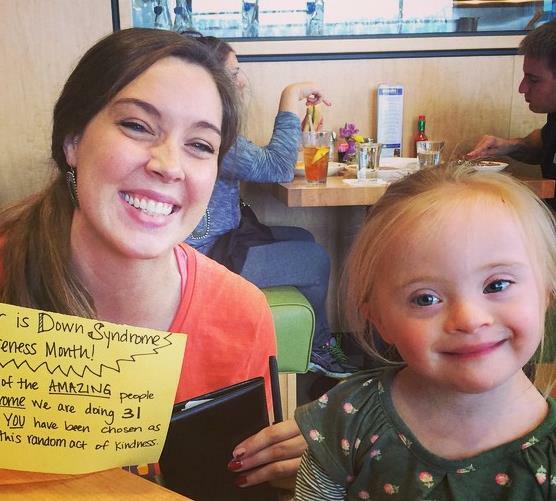 The Down syndrome community is celebrating with love and kindness! One simple act of kindness can have a lasting impact. One random act of kindness can create a ripple effect as recipients pay it forward and experience the joy of anonymous giving. It's impossible to pay it forward and not feel better about the day. And it's impossible to be on the receiving end of a random act of kindness and not feel like your entire day just got a whole lot better. This March 21st, on World Down Syndrome Day (WDSD), many in the Down syndrome community will put this idea into action. This WDSD, individuals with Down syndrome and those that love them will have fun and get creative while spreading kindness in their community. This simple act is sure to spread goodwill and cheer as well as work as an incredible awareness opportunity. Seven national Down syndrome organizations collaborated on the new campaign, the Random Acts of Kindness campaign, to celebrate all people with Down syndrome this World Down Syndrome Day. WDSD is celebrated each March 21 (3/21 representing the triplication of the 21st chromosome). The International Down Syndrome Coalition, National Down Syndrome Congress, Down Syndrome Affiliates in Action, International Mosaic Down Syndrome Association, LuMind Foundation, National Down Syndrome Society and Global Down Syndrome Foundation banded together in creation of this fun and easy campaign that anyone could participate in. The campaign is intended to complement all existing campaigns for WDSD. Let's face it -- families are busy! Random acts of kindness don't have to be time-consuming or labor-intensive and can take place anywhere, at any time, by anyone. It's a simple as writing a note of appreciation, or buying coffee for the person behind you in the drive-thru lane or leaving a bag of microwave popcorn taped to a Redbox machine. 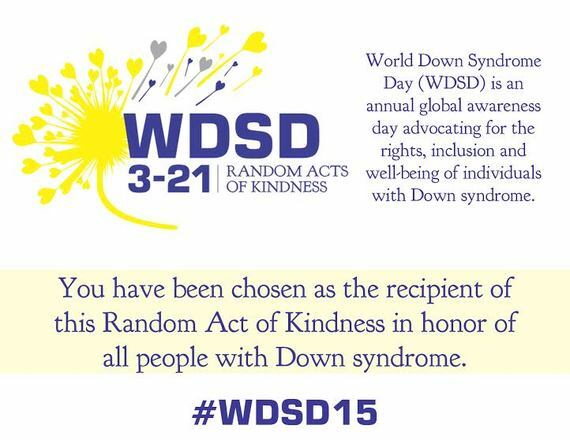 One fun part will be involving loved ones with Down syndrome in the decisions and enactment of the acts of kindness. While it's certainly a false stereotype that people with Down syndrome are happy all the time, I think it's fair to say that many with Down syndrome have kind and giving spirits. In my experience, spreading love and kindness comes naturally to many with Down syndrome. On March 21, participants can choose to wear a shirt that says something about Down syndrome. Don't own one? That's okay! Choose an act of kindness. Make it simple and fun. Maybe try for one to three random acts on WDSD. 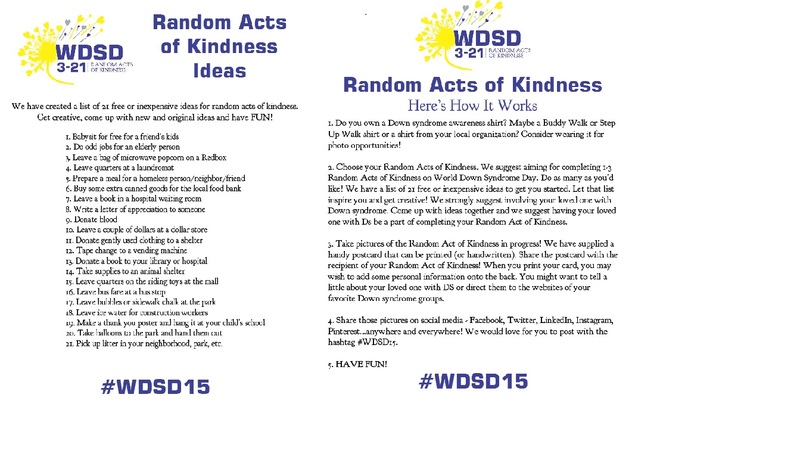 Print out, or handwrite, the postcard (below) and give that out along with the random act of kindness. Take pictures of your random act of kindness! Post those pictures and stories on social media with the hashtag #WDSD15. In addition to the postcard, the campaign committee created a list of ideas as well as the "Here's How it Works" instructions. 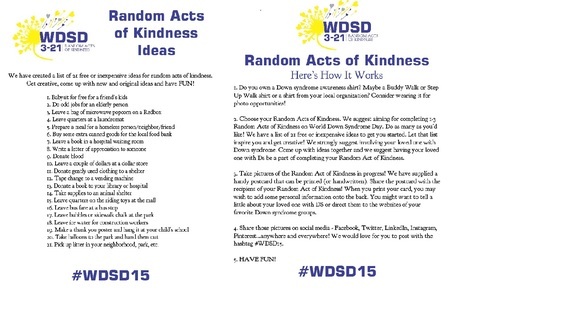 A Facebook group, WDSD Random Acts of Kindness, has been created to share pictures and ideas of random acts of kindness. Members can share stories of kindness and read stories of kindness from the community. Want to learn more about this new collaborative campaign? Watch this webinar to learn more and download the full toolkit. Help spread the love this March 21st, on World Down Syndrome Day, with some random acts of kindness! I look forward to seeing the pictures and hearing your stories! The International Down Syndrome Coalition (IDSC) is dedicated to helping and advocating for individuals with Down syndrome from conception and throughout life. We promote the dignity and respect of individuals with DS and assist the families who love them. We provide support, education and connection to other families as well as to local resources. The IDSC operates and advocates independent of any political cause or religious affiliation, and we welcome all to our community.